With CMA Fest and the Stanley Cup Finals both aligning on the calendar in June, we were busy. 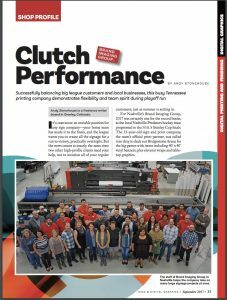 But our team and Nashville sign and print shop is prepared for such a rush in production, and the work we delivered in that span has earned us a spot on the cover of Sign & Digital Graphics magazine. The accompanying article praises us as “the go-to print and sign company in Music City.” It was a crazy couple of weeks, but we didn’t skip a beat as we worked long and hard to turn out signs, stage coverings, car magnets, street banners, table tents, bike rack covers, and a variety of other projects for our amazing clients. We understand that your business wants to strike when the iron is hot, and we take great pride in our fast turnaround times, no matter how small or large the job is. We are committed to that and to you if you call upon us to be your sign and print partner. We’re proud that our dedication and work is making making headlines. Click here to read the article in the September issue of Sign & Digital Graphics, and see our feature on pages 33 through 39.